As a parent and dog owner, its your responsibility to make sure your children and pet are safe at all times. Dogs make fantastic family pets, and with a little care and guidance most children learn how to treat a dog. Children naturally adore puppies, but its important for your child to realize that the dog isnt a toy. Children have been known to be seriously injured by a dog, but that doesnt mean they shouldnt be allowed to interact. The most common problems occur when a child is over friendly with a dog, which then eventually snaps to make them go away. Many children have difficulty in recognizing the subtle signs of a dog running out of patience, and may continue to inadvertently overwhelm the animal. Young children are especially likely to make this mistake  children under five are statistically the most likely to be injured by a dog. 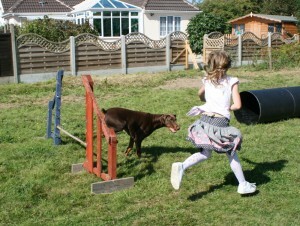 Your child may also think its a game to try and get the dog to chase him or her, which is never a good idea! There are a number of strategies you can use to minimize the risk of your child getting bitten. Firstly, young children and dogs should be supervised by an adult at all times. Even leaving a dog alone with a child for a short period could be dangerous. Children also need to be taught that the dog is just like a human  it needs its own space and alone time. Its a good idea to setup an area that is only for the dog, and teach your child to never disturb the pet when its there. This is where crate training comes in really handy. Children should also never try to touch or interact with a dog while it is sleeping, eating or in its bed. On the other hand, small dogs and puppies can be at risk of injury from children. A toddler may drop a dog, or even step on it, breaking its foot or leg. This is another reason for adult supervision at all times. Your child should be taught to treat the dog gently and with consideration, and they should only cuddle the dog while sitting down quietly. There are a number of studies which show the benefits of raising a child with a dog. Children with pets, for example, are known to grow up with better social skills and to be more outgoing. They also have a stronger immune system and are more likely to be active. As long as you take the proper precautions and train both your child and dog to interact safely, the chances of injuries or bites are very small. In most cases where a child has been bitten by a dog, the tragedy could have been avoided by the owner taking the right precautions. Susan Wright is a vet and a freelance writer. Susan often shares advice on how the whole family can get involved with the care of their beloved pet.